As a young girl I would often go and visit my grandparents for a week or two at a time. During my time there in the small village I would enjoy walks with my Grandad and his dog Gwen down to the river, where my Grandad would attempt to teach me how to skim stones (I still can’t do it properly). Play in the village school yard and collect pine cones in my Grandad’s enormous red spotty handkerchiefs. If the weather was bad or my Grandad was too busy to take me out I would sit in the kitchen completing a jigsaw puzzle whilst watching my Granny bake. There was however one golden rule about jigsaw puzzles they had to be completed by teatime so they could be packed away ready for our tea before my uncles came to have their tea. My love of jigsaw puzzles has continued and we often have one going on the dinning room table at work where the patients come and add a few pieces, although I think the staff pay more attention them than the patients. Roo has always been a fan of completing puzzles since she was quite young, moving from the baby wooden animal puzzles to 4-in-1 puzzles and recently has been happily completing 500pc jigsaws on her own. So when Wentworth Puzzles got in touch to ask if we would like to select a puzzle from the children’s jigsaw range it took me a little while to my up my mind as to which one would be perfect for Roo’s next challenge. With her increasing love of fairies I knew I had to chose something that was going to engage her as she completed it. Why choose a Wentworth wooden puzzle? 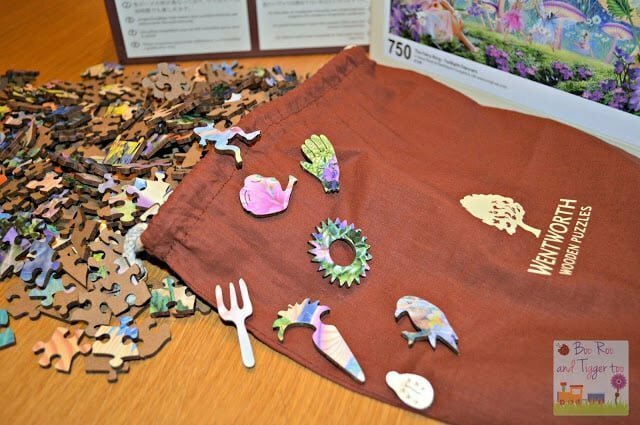 All *puzzles come in a cloth bag inside a sturdy cardboard box made from recycled material. *Except for micro, mini and midi size puzzles. With prices starting at £26.95 for a 200pc jigsaw they are more expensive than your average high street puzzle, but believe me once you have seen the quality of the puzzle for yourself you can easily justify the extra cost. This is a jigsaw that will be completed for years to come and I hope that one day Roo will be able to pass it down to her children. I’m not going to lie and tell you that completing this puzzle was easy, because it really wasn’t. The unique puzzle pieces certainly add that extra difficulty to the jigsaw, with both straight edges being used on the edge and in the middle it was difficult to do the conventional edges first and then the middle approach. The good thing about the puzzle is that every time you complete it there will be new pieces and features within the puzzle that you will discover. 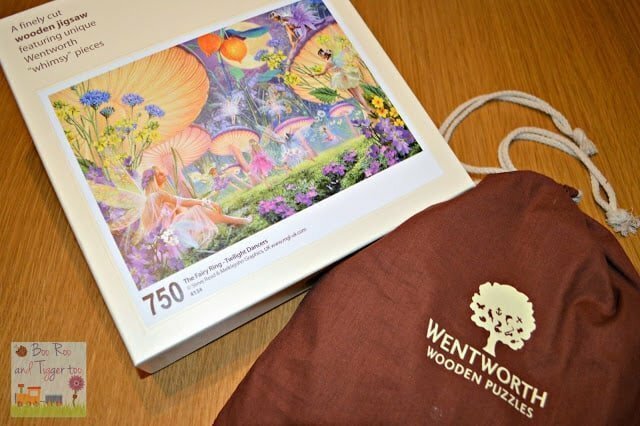 Disclosure Policy: We received a Wentworth wooden puzzle: The Fairy Ring – Twilight Dancers FOC for the purpose of review.